From the stranger than fiction files, comes a video of an adult hippotamus seemingly saving the lives of baby wildebeest and zebras by helping them cross a crocodile filled raging river. Tom Yule, manager of the Grumeti Expeditions tour operating company..."This is the time of year that the migration of wildebeest and zebra starts moving south from the Masai Mara in Kenya, heading for the short-grass plains of the southern Serengeti," said Yule. "One of their big hurdles is the Mara River, which was flowing very strongly that day because of recent heavy rains." Yule and several others saw the strong current sweep a young wildebeest calf downstream. "The hippo immediately went after it and positioned itself on the downstream side of the calf, nudging it with its snout and keeping it above the water all the way across the river until the calf reached the other side and managed to get out and join the rest of the herd." Barely five minutes later the water swept away a zebra foal. The hippo immediately set off after the foal and helped it toward the opposite bank in the same way. "It was incredible to watch," said Yule. The foal was utterly exhausted when it eventually managed to get on to a little rock island very close to the opposite bank. "It just stood there panting," he said. "The hippo got out of the water and came up behind the foal and started nudging it and gently biting it on its backside as if to say, 'Come on man, don't give up now, you can do it. Just a hop, skip and a jump and you're there.' "The foal slowly stepped off of the island and crossed the little channel on to the opposite side and rejoined the rest of the family group." 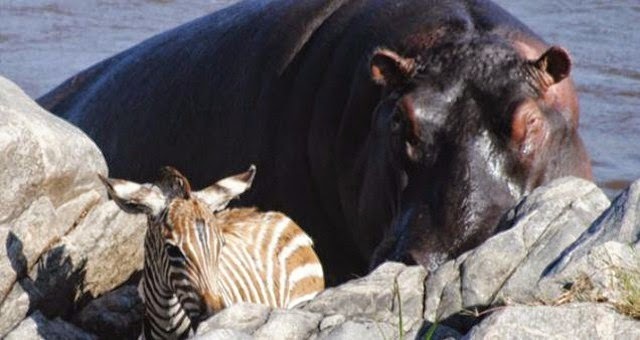 Responses to "Hippo Saves Baby Zebra, Wildebeest From Drowning (VIDEO)"
That was amazing. It shows that no matter what type of species it is. They all have the instincts to protect the babies . What a wonderful hippo that is. What an amazing animal, always look out for the little guy!!!! The hippo is one of the most dangerous animals in the world towards humans, so what does this tell us? There are lessons to be learned from the animal kingdom and caring for others inspite of all the danger among them with their instinctual predatory needs for their survival. It is a mix. that was an amazing video to watch and makes us wonder hey that even the bigest animal has a heart to help somone esles baby lovely hipo just goes to show what animals scan do to help others Val of Perth W.A. What a great story who would have known that a hippo saves younger animals.Love this one to. The migration of the animals crossing the Mara is one of the deadliest. Nature is brutal, and yet full of wonder at the same time. The foals that made it to the other side now have to find their mothers in the million + animals that made it across the river. Those that do not will never survive.